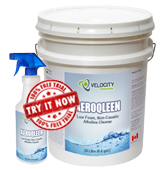 AEROQLEEN is a low-foaming, non-caustic alkaline cleaner used to remove grease and carbon from various metal surfaces. Used by sawmills, plywood mills, mines, railroads, and transmission and engine rebuild shops to remove wood dye, carbon, oil and other contaminants from components. Remove excess grease and oil prior to application. Dip Tanks – use at 10% to 20% concentration at room temperature to 190°F (88°C). Automatic Parts Washers – use at 5% to 10% at 175°F to 185°F (79°C-85°C). High-Pressure Washing and Steam Cleaning – use approximately 0.3% to 1.0% concentration at the tip. AEROQLEEN is safe on all types of metal if used as directed.